My new favorite artist was born in Israel, but now lives and works in Berlin. 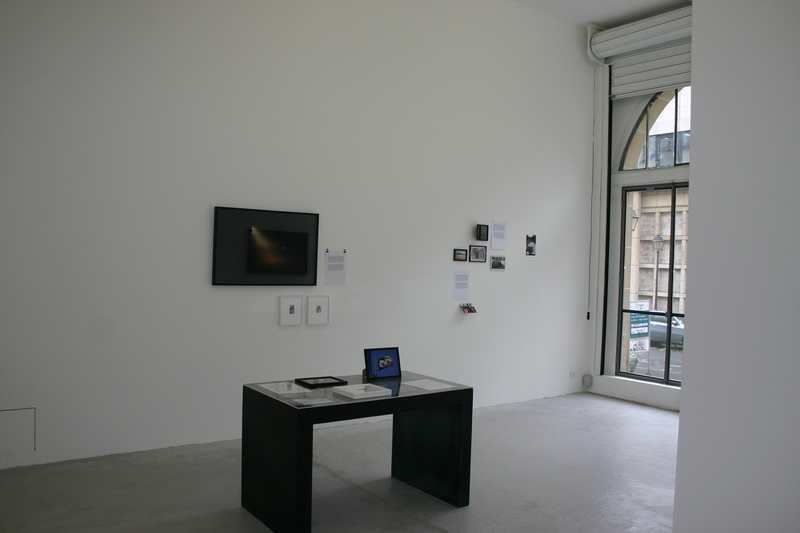 It is a pity that it is virtually impossible to show pictures of works based on video or conceptualism. I have a view of the installation “Forlorn Lover’s Guide to the Underground and to Doubles” which will only show how he arranged the photos and documentation. The other work “Nostalgia” I II and III are in the form of video footage. Fast does all the work himself – he films, edits, plays and writes the pieces. He borrows extensively from existing open-sources such as CNN or film and then cuts, pastes and inserts pieces or remakes to create entirely new work. “Nostalgia” I starts off with an interview with a Nigerian refugee who wants asylum, but he needs a job. Fast, showing both himself and the Nigerian, interviews the man for the potential job as extra in a film. He asks the man to tell him about his home in Nigeria. Somewhere during the difficult interview the man tells Fast how they used to make traps for catching monkeys that they then ate. Fast’s face shows his disgust, but the man just laughs. This is how Fast starts the construction of many of his videos, by blurring reality and fantasy, and then rejecting the specific political content. In “Nostalgia II” he takes this one story (of the trap) inserts it into a new story, but it is “Nostalgia III” that developed the political content further. Now it is 3 European people who travel through a maze of tunnels trying to reach an African Colony where they will seek asylum. The girl is killed by border guards. 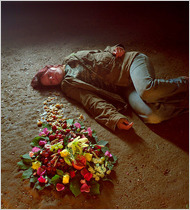 The picture shows her lying on the ground, and flowers forming where she threw up her food. It is a scary movie, depicting contemporary problems of border zones, displacement and immigration, to ask the viewer: what if the tables were turned? By starting with the interview, as Fast has done in previous works as well, he questions the memory of the person being interviewed. A good example is “Spielberg’s List” (not on this show) where Fast interviewed people who played as extras in Spielberg’s film. Some of them were alive during WWII, but all of them had taken Spielberg’s film as the basis of their own “memory”. Fast says that when recollecting a story, we make a thousand choices of how to tell our story, and it is this element that fascinates the artist, and he uses it by breaking up his footage of the interviews and re-pasting them together again to make up another story altogether. I found exerts of his video on Youtube, google it to see for yourself.